The Sigma 18-250 f3.5-6.3 DC OS HSM - Canon Fit - incorporates Sigma's original Optical Stabilisation function and has a 13.8 times zoom ratio. As opposed to having an anti-shake function in the camera body, this lens's Hybrid Optical Stabiliser provides not only an anti-shake function for the camera body, but also compensates for image shaking in the view finder as the Optical Stabiliser is built in to the lens. Four Special Low Dispersion glass elements and three aspherical lens elements provide excellent image quality throughout the entire zoom range. 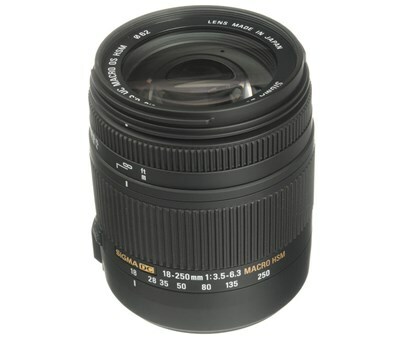 This lens has a minimum focusing distance of 45cm (17.7 inches) at all focal lengths and a maximum magnification ratio of 1: 3.4, making it ideal for close-up photography. The lens incorporates super multi-layer coating to reduce ghosting during backlight photography. An inner focusing system eliminates front lens rotation, making it suitable for use with circular polarising filters and the supplied petal-type hood.